$175; $150 by March 9th! This workshop series has been cancelled! We hope to practice with you another time. As we all know, waking up is hard to do! Staying awake can be even harder. In the Enneagram world, Don Riso and Russ Hudson identified nine specific “Wake-up Calls” to remind each of the types how to recognize when they are asleep. Gurdjieff taught that we have to learn how to construct and set our own “alarm clocks” if we want to be wakened from our typical slumber. 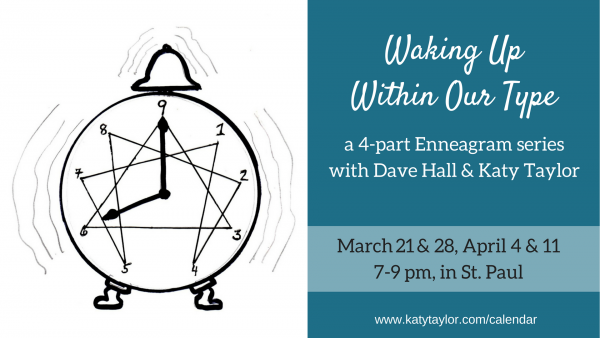 Join Dave Hall and Katy Taylor for a 4-part workshop series devoted to the fine art of waking ourselves up. Together, we will explore how to bring fun, creativity, compassion, and a sense of humor to the project of living more fully awakened lives. Workshop Cancelled: Wednesdays, March 21st & 28th and April 4th & 11th, from 7:00-9:00 pm.